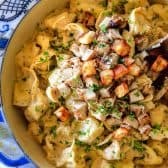 Tender chicken and pillowy tortellini in a creamy lemon garlic sauce. Add all chicken marinade ingredients to a large freezer bag or bowl and whisk to combine. Add chicken, toss to evenly coat. Refrigerate at room temperature for 30 minutes or refrigerate up to 4 hours. Preheat oven to 400F degrees F. Whisk together olive oil, Parmesan, garlic powder and salt in a medium bowl. Add cubed bread and gently toss until evenly coated. Spread bread in an even layer on a baking sheet and bake for approximately 10 minutes or until golden. Cook pasta al dente according to package directions in salted water. Remove 1 cup pasta water before draining. Meanwhile, heat one tablespoon olive oil in a large skillet over medium high heat. Remove chicken from marinade and dab off excess then add to hot skillet and cook, undisturbed, for 3-5 minutes, or until nicely browned on one side. Turn chicken over, cover, and reduce heat to medium. Cook for approximately 5-7 more minutes (depending on thickness of chicken), or until chicken is cooked through. Remove to a cutting board and let rest 5 minutes before chopping or slicing. For the sauce, melt 1 tablespoon butter in 2 tablespoons olive oil over medium heat in a large skillet. Add garlic and sauté 30 seconds. Sprinkle in flour and cook while stirring for 2 minutes (it will be thick). Turn heat to low then slowly whisk in milk, followed by lemon juice, Dijon, Worcestershire sauce, fish sauce, chicken bouillon and all seasonings. Increase heat to medium high and bring the sauce to a simmer until slightly thickened, stirring constantly. Reduce heat to low and stir in cream cheese until melted followed by Parmesan cheese until melted. Stir in tortellini and chicken until well coated and heated through, adding additional reserved pasta water a little at a time if needed to reach desired consistency. Taste and season with additional salt, pepper and/or lemon juice to taste. Garnish with freshly grated Parmesan Cheese, crouton and fresh parsley if desired.